Boat Description The pleasures of cruising across open water are at their best when your boat is a beamy Quicksilver day cruiser. 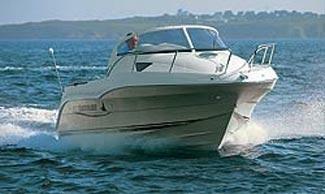 The 650 Cruiser is a fully-featured boat with beige-coloured hull and burgundy accents. This Cruiser is a great way to travel the coastline, in comfort and style. Power is from a Mercury MerCruiser diesel or petrol sterndrive. Engine Notes Power is from a Mercury MerCruiser diesel or petrol sterndrive.